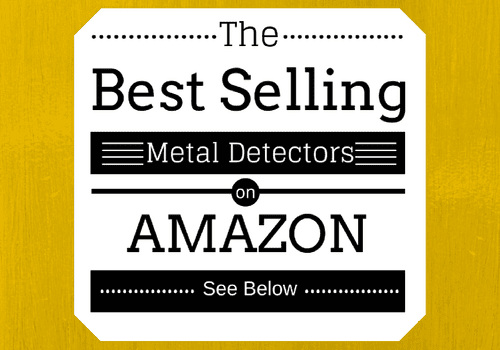 Garrett’s line of Ace metal detectors has become immensely popular with detectorists. The Ace detectors are easy-to-use machines that are loaded with features at a decent price. Detectorists can easily sort out which of these units are more advanced than the others because of the numbers given to them. 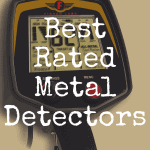 In this article, we’re going to review the Garrett Ace 300 and compare it to a few other noteworthy metal detectors. And to better illustrate this, please use the interactive table below to directly compare the Ace 300 to other Garrett detectors (as well as models made by other brands). You can compare these machines based on price, special features, and more. The Ace 300 can be purchased for around $250, and you’ll get a good entry-level machine for that money. This detector is the updated version of the Ace 250. It has 8 sensitivity and depth adjustments, which is great at cutting down on false signals when you’re working in areas of heavy mineralization or near power lines. 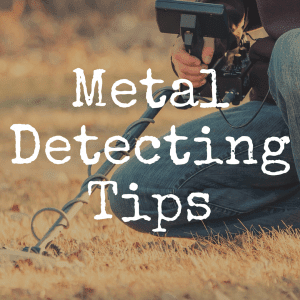 These situations can cause a lot of chattering from your metal detector, but if you lower the sensitivity you’ll eliminate some of that and be left with true signals. The Ace 300 has electronic pinpointing, which when used correctly can help you hone in on your target so you don’t end up having to dig two holes because you misjudged the location of the signal. It has 5 search modes – jewelry, custom, relics, coins and zero discrimination. The display screen gives you a lot of information while still being easy enough to operate that beginners will be able to figure it out. It has digital target identification from a scale of 0 to 99 so you’ll be able to determine whether you want to dig. The higher the number on the scale, the more conducive the metal is. So metals like silver will be at the top of the scale, while metals that are usually undesirable, like irons, will be in the lower range. The Ace 300 has enhanced iron resolution, which means it will be even better than some other detectors at getting rid of trashy targets. It has three audio tones that will help you identify which signals you might be interested in digging. The coil is waterproof, but the control box isn’t, so you won’t be able to fully submerge this detector in water. But you’ll be able to work in extremely shallow water. It has a 7- by 10-inch concentric coil. That’s a decent size for general metal detecting purposes. The biggest drawback to this machine is its lack of adjustable ground balancing, which is helpful when you’re working in mineralized soil. 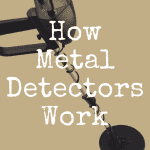 But for the money, this is a great detector for a beginner, or even an intermediate-level detectorist who doesn’t want a machine that’s too complicated to operate. 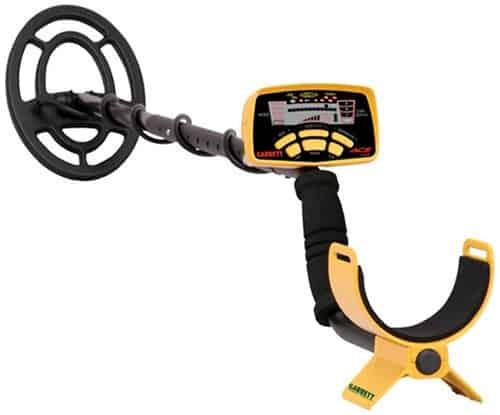 You can get the Garrett 250 metal detector for just over $200, which is a little cheaper than the Ace 300. But the Ace 300 has several features the Ace 250 does not. For starters, the Ace 250 doesn’t have digital target identification. Once you’ve had digital target identification, it’s hard to go back to the graphic target identification that the Ace 250 has. The digital numbers are so much quicker and easier to interpret than graphics are. In addition, the concentric search coil on the Ace 250 is a little smaller than it is on the Ace 300. The Ace 250’s coil is 6.5- by 9-inches, compared to the 7- by 10-inch coil on the Ace 300. So the Ace 300 will detect items a bit deeper than the Ace 250 will. The operating frequency is also a little lower on the Ace 250 at 6.5 kKz, compared to the 8 kHz operating frequency of the Ace 300. That means the Ace 300 will be superior at finding smaller items than the Ace 250 will be. The discrimination is also better on the Ace 300 – you’ll be able to better weed out unwanted iron signals with this detector. The Ace 250 does have the basic features you’d expect to see on a good entry-level machine, including a pinpointing feature that will help you more accurately locate your targets. Like the Ace 300, the Ace 250 doesn’t have adjustable ground balancing. If I were choosing between these two machines, I would save a little more money and splurge on the Ace 300. Between the bigger coil size, the higher operating frequency and the digital target identification, the Ace 300 is definitely worth the extra few dollars you’ll pay. You can read our review of the Garrett Ace 250 metal detector here. The Ace 350 runs just under $300. And while that’s slightly more expensive than the Ace 300, it does come with a bigger search coil. The Ace 350 has an 8.5 by 11-inch waterproof coil. That’s a good size for depth and for being able to search a property quickly. The quicker you can cover ground, the better chance you have of making the find of your life. The Ace 350 also has enhanced iron resolution, which means you’ll be able to hunt happily at beaches and parks without getting as many junk signals that leave you frustrated and exhausted. 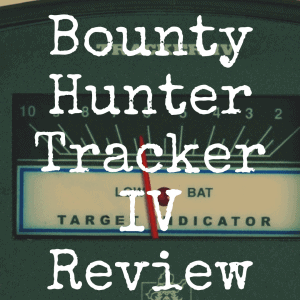 This detector has five search modes, including all metal, jewelry, custom, relic and coins. If your favorite thing to find is coins, you can use that mode to filter out the signals that aren’t likely to be coins. These modes can be a timesaver if you’re a detectorist who is interested in one certain type of treasure. You’ll also get electronic pinpointing with the Ace 350, which is helpful, but not a substitute for a good handheld pinpointer in my opinion. The frequency for the Ace 350 is a smidge higher than it is on the Ace 300 – it’s 8.25 kHz instead of 8. But one big downside to the Ace 350 is that it doesn’t have digital target identification. That might be a dealbreaker for some people, who prefer the ease and convenience of digital identification. While this is a good machine, it’s still not appropriate for detectorists who are looking to do a lot of beach hunting. While this will be just fine in dry sand, it won’t be able to handle the highly-mineralized conditions of wet sand or salt water. But, if you plan to stay away from the coasts, this is a great unit for detectorists. It’s comfortable to carry and comes with pre-programmed modes you can use if you don’t want to go through the trouble of finding your own settings. You’ll be getting a highly-functional machine that’s really easy to use, even if you are the type who is often overwhelmed by technology. You can purchase the Ace 400 for under $350, and it’s pretty similar to the Ace 300 in most respects. It does have a larger coil though. It has the same size of coil as the Ace 350 – an 8.5- by 11-inch waterproof coil. I’m a fan of larger coils, but every detectorist has his own opinion about coil size. Large coils are not always ideal, because if you’re hunting in trashy areas, you run the risk of missing signals. For instance, if a small segment of the ground has multiple pieces of metal, which happens far more than you might imagine it does, a nail that’s there could give off a signal and another target that’s right there could be missed because the detector is too busy reading the nail. That target might be a valuable coin or a ring, but you won’t even know it’s there. Smaller coils, like those that are 5 inches, help with that target separation so you’ll hear more targets in trashy ground. But the downside to smaller coils is that you get less depth. I hate the idea of losing depth, so I prefer bigger coils. Ideally, if your budget allows it, you can get a detector with a bigger coil and then buy an interchangeable coil that’s smaller in size. That way you get the best of both worlds. You can use your bigger coil for most hunts and switch out to the smaller one when you know you’re facing trashy conditions. Aside from the larger coil on the Ace 400 and an increased operating frequency of 10 kHz, it offers the same features as the Ace 300, including 8 sensitivity adjustments, electronic pinpointing and five search modes. Just as with all of the other Aces, I wouldn’t recommend this machine if you’re a frequent beachcomber or if you want to do shallow water hunting on saltwater coasts. It just won’t have the ability to deal with the highly-mineralized conditions you’ll need to handle in that type of hunt. But for general metal detecting on regular land, this is a great detector to have at your side. You can read our review of the Garrett Ace 400 right here. There’s no way to lose when you order an Ace metal detector. Whether you’re a newbie detectorist with not much money to burn so you opt with the Ace 250, or if you break the bank and go for the Ace 400, you should be pleased with the quality of the machine you get. If you can afford the Ace 400, that would be my pick because of the large coil size, digital target identification and higher operating frequency. To make your hunts more enjoyable and to aid you with your target recovery efforts, I would suggest adding a Garrett Pro pinpointer to your purchase, no matter which of these machines you decide to buy. It isn’t a necessity, but you’ll be amazed at how much time it will save you when trying to find small targets. I’d be lost on my hunts without my pinpointer. They all offer good features for how affordable they are. They all have arm straps, which make them easier and more comfortable to carry. Plus, every one of these machines are lightweight, which means you’ll be able to hunt long and hard without feeling fatigue or having to take a day off. As long as you’re out there searching, you have a chance of uncovering the find of your life. If you’re sitting on the couch, nursing a sore arm from handling a detector that was too heavy, you’re missing out on the opportunity to find something great. Are Metal Detecting Clubs Worth Joining? 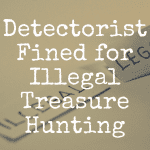 Metal Detecting Laws: Where Can I Detect Treasure? 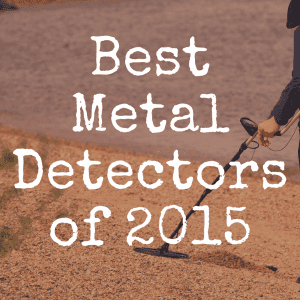 What’s the Best Rated Metal Detector?